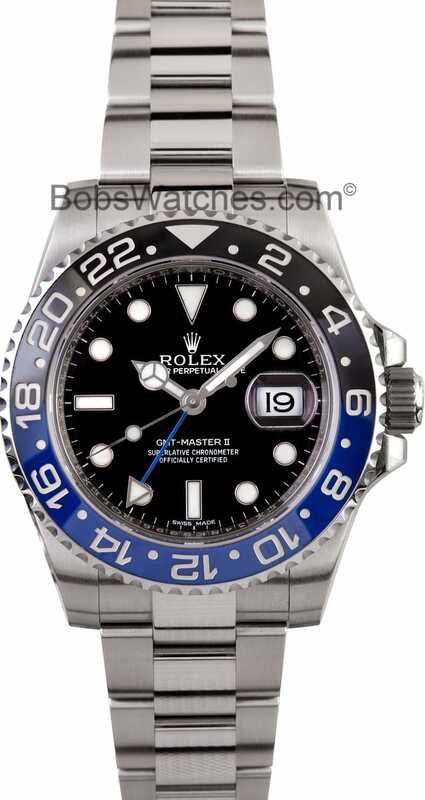 At Bob’s Watches we see our fair share of Rolex watches flying off the shelves. When it comes to fashion and the Rolex watch world there are watches that are in high demand and others that have a lesser demand. 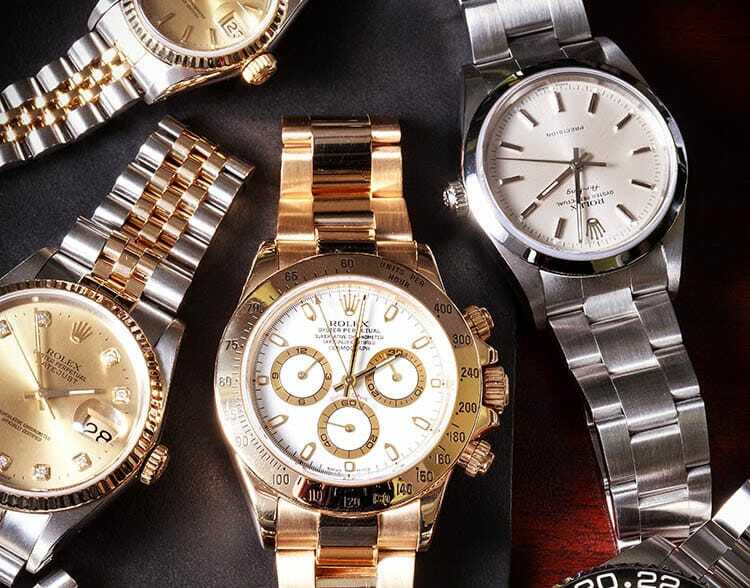 If you are looking for a stylish watch that will turn heads and transform you into the envy of the neighborhood, take a look at one of the top selling Rolex watches. For those who want to go against the grain you might want to check out the “What’s Not” section. No matter what your choice you can’t go wrong with a timeless Rolex watch. Bob’s Watches has seen a surge in demand for two watches over the last few months. We can’t keep them in stock. If you are looking for a hot watch that is in high demand you will want to consider one of these two options. The all-new Rolex GMT-Master “Night & Day” displays a striking color combination of black and blue, mimicking the colors sported by the fictional action hero Batman. This watch sports an interesting combination of both colors, unlike any other Rolex created before. 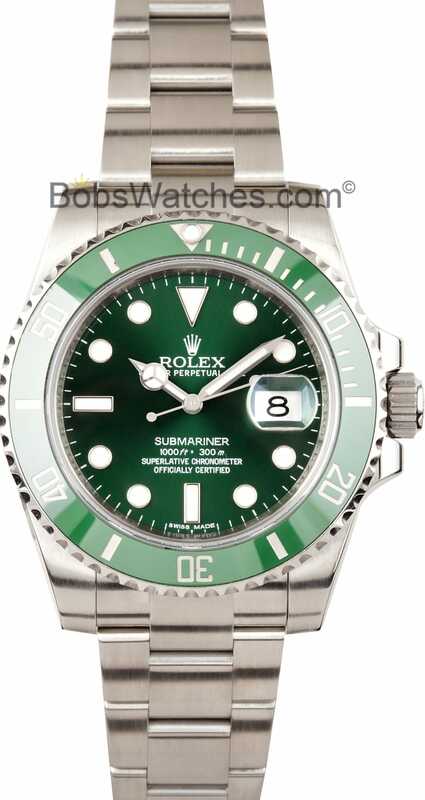 Just as other special addition Rolex watches have received nicknames, like the all Green LV Submariner fondly called ‘The Hulk,’ the Night & Day has been fondly called the “Batman,” due to its coloring, strong and durable design, and high tech features. It is a great collector’s piece, as well as a versatile and stylish accessory, fitting for most occasions. 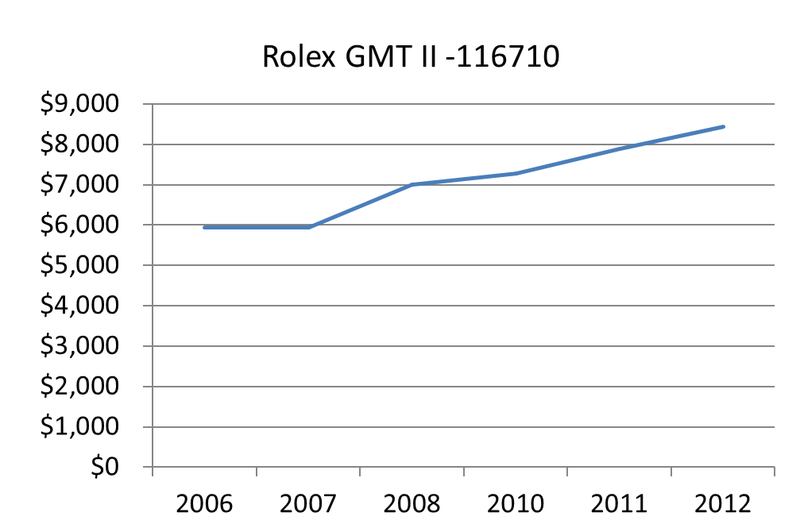 The retail pricing for the Rolex GMT 116710 has seen a steady increase. Looking at the current trend, these watches will likely increase in value. The French term serit means ‘setting,’ but has also come to represent a style of Rolex watches, featuring jewels set within the design of the watch. The Submariner 16613 is of the serti design, featuring a champagne or slate dial set with 8 round diamonds and 3 sapphire markers. 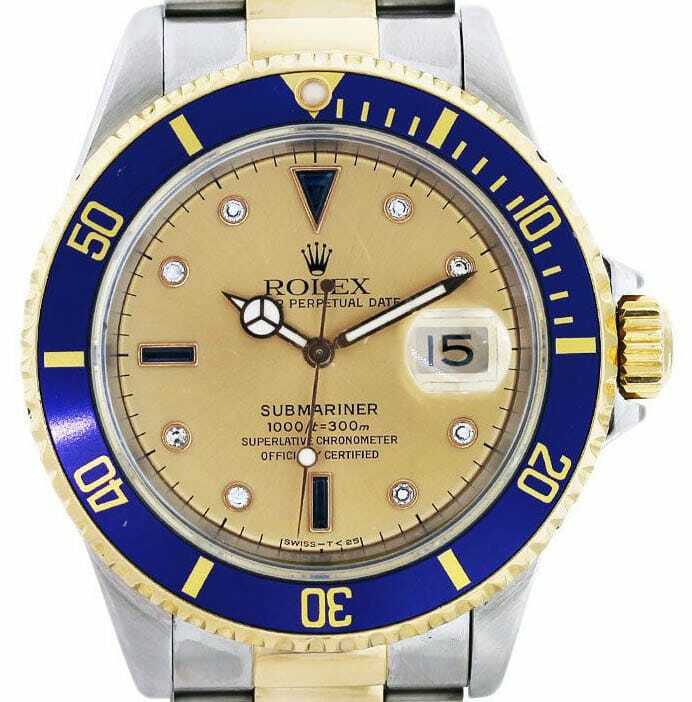 The Rolex Submariner 16613 is a Perpetual watch meaning it runs continuously for 2-3 days without requiring movement. Movement, rather than winding, keeps it running. Its combination of 18k gold and stainless steel paired with its ability to resistant water up to 300 meters makes it a classy and luxurious option, while still offering the endurance one expects from a Submariner. While this specific watch has been discontinued, retail on the 16613 has seen a steady increase over the years. While still a stylish and popular watch, Bob’s has noticed demand for the 116610 decreasing. The Green Rolex Submariner offers some improvements to the model, but has also drawn some criticism. The movement, in particular, has been said to lack refinement and technological prowess. This is easily debated, however. The Submariner is designed for divers, thus is made to withstand high water pressure. When the watch is used for its designed purposes, it functions more as a tool than an accessory. Despite its tool-like concept, it is still a beautiful and functional accessory. The ceramic bezel fabrication process has been improved, creating a truer color. Larger markers and bigger hands have been added to the watch, along with an anti-reflective coating on the date bubble crystal changing the watch’s appearance slightly, but making it more legible. The Glidelock clasp is a new addition which allows for simple and fine adjustments, allowing the watch to be easily and securely placed over a dive suit. Inside, the watch has also received some tweeks. For example, the old Rolex Caliber 3135 has been upgraded to a new Parachrom Bleu hairspring. This hairspring is completely anti-magnetic and highly temperature- and shock-resistant. Thus, it is built for enduring the many adventures the wearer may plan, while still maintaining its sporty exterior. Despite its slow movement now, its precision design and craftsmanship will endure, leading to appreciation in the future. 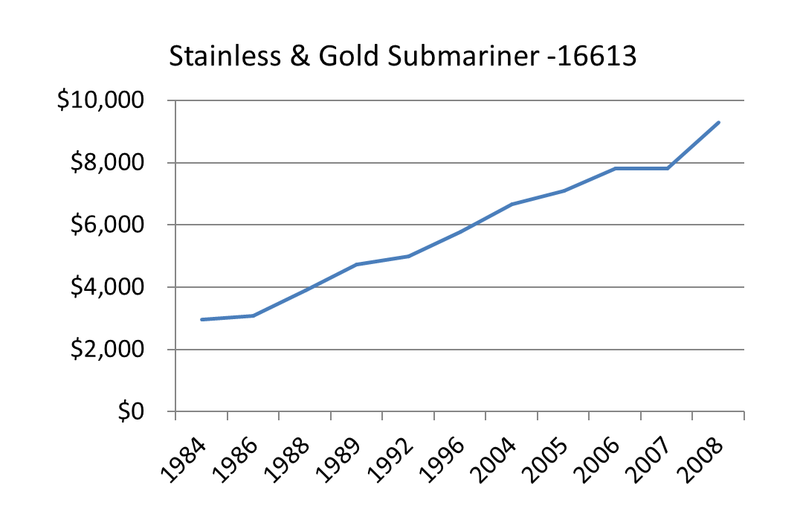 The Rolex Submariner 116610 models have seen an increase in retail price over the years as seen in the below chart. 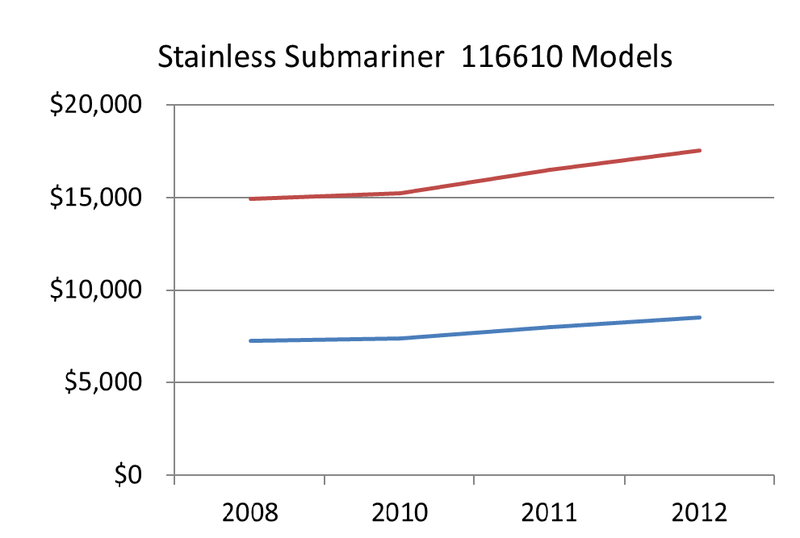 The blue line represents the black dial 116610N models and the red line represents the green dial 116610V models.